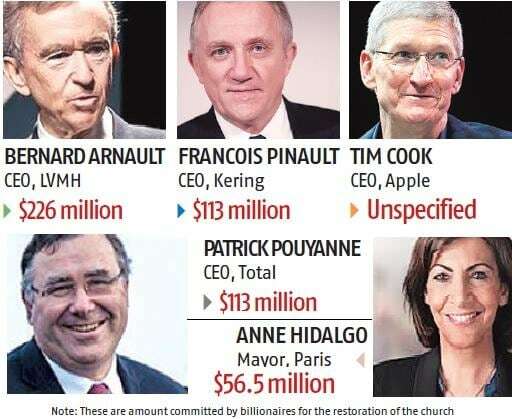 Billionaires and local governments pledged nearly 500 million euros ($565 million) on Tuesday to help restore Notre-Dame cathedral, with foundations and crowd-sourcing sites also launching fund-raising drives. 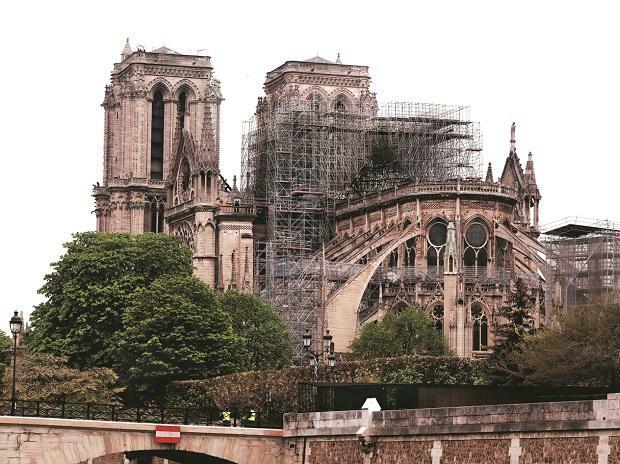 President Emmanuel Macron has vowed the emblematic monument will be rebuilt after its spire and roof collapsed Monday night in a blaze thought to be linked to extensive renovation work. French luxury group Kering, whose brands include Yves Saint Laurent and Gucci, kicked off the campaign late Monday with a promise of 100 million euros ($113 million). That was followed Tuesday by a 200-million euros pledge from its crosstown rival LVMH and the family of its founder Bernard Arnault. The chief executive of French oil giant Total said the firm would contribute 100 million euros. Other high-profile French donors so far included the investor Marc Ladreit de Lacharriere with 10 million euros, and construction magnates Martin and Olivier Bouygues, also with 10 million euros. Pledges were also pouring in from anonymous donors to groups including the privately run French Heritage Foundation, which said it had already secured pledges totalling 1.6 million euros. On a more modest scale, a fund set up by an “anonymous Parisian” on the Leetchi fundraising platform had topped 20,000 euros at midday on Tuesday. And the Hungarian city of Szeged promised to donate 10,000 euros to the reconstruction effort, in recognition of the help it received from the French capital after a devastating flood in 1879. Paris Mayor Anne Hidalgo said Tuesday that the city would unlock 50 million euros, and proposed holding an international donors' conference in the coming weeks to coordinate the pledges to restore the gothic architectural masterpiece. Specialised craftsmen and rare materials are also expected to be needed to restore the monument, which welcomes around 13 million visitors each year — an average of more than 35,000 people a day. The United Nations’ Paris-based cultural agency UNESCO has promised to stand “at France’s side” to restore the site, which it declared a world heritage site in 1991. The German and Italian governments have also offered to help in the reconstruction, while Russian President Vladimir Putin offered to send “the best Russian specialists with rich experience in the restoration of national heritage monuments.” The painstaking renovation work is likely to cost hundreds of millions of euros over several years, if not decades, though experts breathed sighs of relief that the damage was not even worse. The steeple of the gothic edifice had been undergoing an 11-million euros ($12.4-million) overhaul financed by the French state to repair damage inflicted by time, pollution and the weather. But it also relies heavily on individual donations for repairs, and a few years ago created a US-registered charity letting American voters deduct gifts from taxes.